Trump Administration Warns Palestinian Aid Recipients That Funds May Soon Be Cut The U.S. Agency for International Development told grant recipients by email Saturday to start planning for the possibility that their funding could end by January 31. 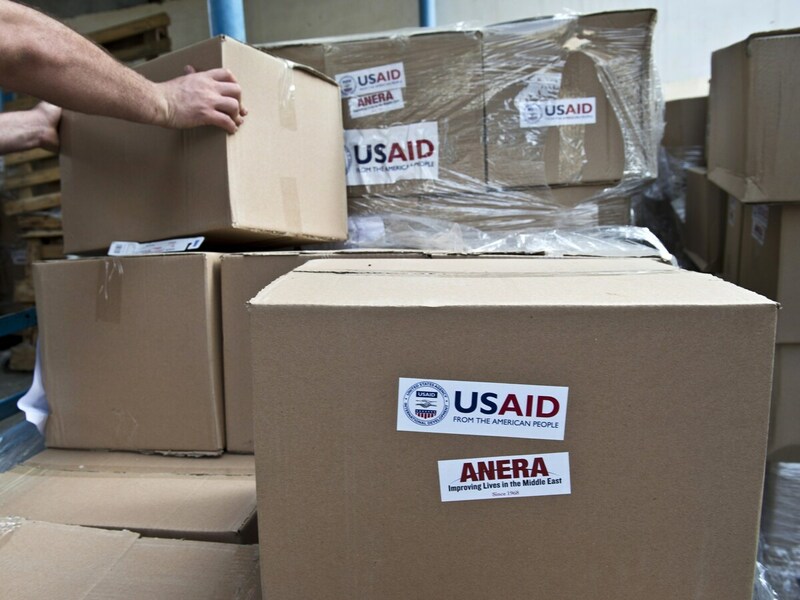 Sanitation kits and soap provided by USAID is transported for displaced people in Gaza City on Aug. 15, 2014. The Trump Administration has slashed more than half a billion dollars to the Palestinians this year. The Trump administration has slashed more than half a billion dollars in aid to the Palestinians this year. Now, the United States says it may cut more money for Palestinians in the West Bank and Gaza Strip. The U.S. Agency for International Development told grant recipients by email Saturday to start planning for the possibility that their funding could end by January 31, due to a new U.S. anti-terrorism law that could compel the Palestinian Authority to compensate American victims of terror attacks in exchange for U.S. assistance — a step Palestinian authorities are considered unlikely to agree to. One U.S.-funded aid group, Anera, said such a funding cut would block at least two planned infrastructure projects to provide clean water to homes in Gaza, which faces a water crisis, as well as a playground for Gaza youth. "It could mean the U.S. is taking itself out of a constructive development role," said Sean Carroll, president of Anera. A U.S. official said the USAID funding cut was not final, and aid money could continue if Congress passes an amendment to the Anti-Terrorism Clarification Act after the government shutdown. A Senate aide said there was bipartisan interest in Congress to find a fix to allow funding to continue. The officials spoke on condition of anonymity because they were unauthorized to brief the media on the matter. The anti-terrorism law could also put an end to U.S. funding to Palestinian Authority security forces, which coordinate with Israel to maintain security in the West Bank. An official in Palestinian Authority President Mahmoud Abbas' office told NPR he believed the U.S. would find a way not to cut security funds. In recent months, the U.S. has slashed $300 million for Palestinian refugees and more than $200 million for humanitarian assistance, economic projects, medical aid and peace-building activities for Palestinians. The cuts were made, in part, to pressure Palestinian leaders to cooperate with U.S. efforts to broker a peace deal with Israel. Palestinian leaders have not resumed ties with the Trump administration since it recognized Jerusalem last December as Israel's capital, a city where Palestinians also have claims. Administration officials say they will unveil a peace plan soon. U.S.-funded aid groups say they had been expecting possible funding cuts. Kids4Peace, a group that runs joint programs for Israeli and Palestinian high school students in Jerusalem, said it has raised money from other sources to ensure its programs can continue without U.S. help. The group said it is a finalist for receiving a $1.5 million USAID grant next year, but fears the grant may now be cut. "Because of USAID, Kids4Peace has doubled in size, professionalized operations, and launched a new youth-led social action program that is creating peace in Jerusalem from the ground up," said Fr. Josh Thomas, executive director of Kids4Peace International. "Without continued funding, we will have to turn away hundreds of Muslim, Jewish and Christian families who want a nonviolent, pro-peace youth program for their kids." Dave Harden, who oversaw U.S. aid to Palestinians under the Obama administration and now directs the Georgetown Strategy Group, criticized the possible funding cuts. "This is another example of the Administration vacating political space, putting at grave risk of any hope for stability, and ceding influence to our adversaries," Harden said.